The Internet is a great place to find a variety of friendship bracelet patterns. Learn everything you need to know to make an easy friendship bracelet! Although friendship bracelets have become more popular during recent years, they have actually been around for centuries. The native peoples of Central and South America are thought to be the inventors of this fun fashion. Tradition says that your friend should tie the bracelet on your wrist and you should both make a wish at the same time. The bracelet is to be worn until it falls off by itself. It is said that at that moment your wish will come true. In reality, the friendship bracelet may not make all your wishes come true, but it is a beautiful gift and a fun craft for older children and adults. Once you decide on your friendship bracelet pattern, you will need to get a few inexpensive materials. You should be able to find these at almost any fabric or craft store, such as JoAnn's or Hobby Lobby. You will need embroidery floss. This comes in small skeins and is available in a wide variety of colors. Each skein will have several strands together. Generally the bracelet instructions will have you use one or two strands of each color. 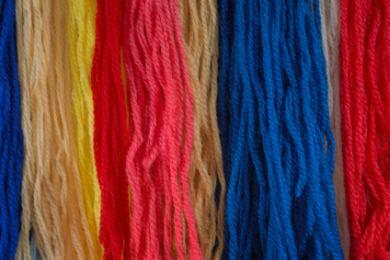 To separate the strands, just gently pull one end away from the rest of the strands of thread. Some friendship bracelets have beads. If you want beads on yours, just make sure that the hole is big enough to accommodate the thread you are using. Smaller scissors that you can control easily are best. Embroidery scissors are a good example. The smaller scissors allow you to snip threads where you need to without fear of cutting into the bracelet. You will need a clip to hold the bracelet while it is being made. A clipboard works very well because it provides a sturdy work surface. Cut each stand approximately 50 inches long for every five inches of finished bracelet. Assign each color a letter or number to identify it. For these instructions letters will be used. Fold the strands in half, and make a knot in the top. Securely clip the knot to the clipboard. Arrange the threads in order, ABCDE EDCBA. It is good to use the darkest color for A. Start on the right with A, and make four backwards knots. In order to make a backwards knot, lay the right thread over the left. Loop the right thread under the left, and pull it up. Repeat. Now, move to the left with A, and make five forward knots in the same way. The fifth knot should be in the center. Continue on like this until you reach the end of the thread or the bracelet is the desired length. Finish with an overhand knot. There are many free friendship bracelet patterns all over the Internet. The patterns are usually just templates or graphs that show where the colors go. Keep in mind that in order to actually create your own friendship bracelet, you will need to know the basics of how to make a bracelet. You can find simple instructions at Friendship Bracelet Instructions. Making friendship bracelets can be a lot of fun for kids and adults. Vary the look by using different thread colors and changing up the width of the bracelets. They make a great activity for keeping busy in the car or while waiting for an appointment.